Etihad Airways, the national airline of the United Arab Emirates was established by Royal Decree in 2003 to change the way airlines’ operated and to bring the very best possible for global travelers - from Abu Dhabi to the world! Since its launch, Etihad has become the fastest-growing commercial airline in aviation history, carrying almost seven million passengers in 2009 alone. Etihad has an airline fleet of 52 aircrafts and currently flies to 60 cities in 41 countries worldwide. In merely six years of operations Etihad was recently awarded the title of “World’s Leading Airline” by the aviation industry at the 2009 World Trade Awards. Etihad Airways has redefined luxury air travel with its new first class suite, which was awarded as the best at the World Trade Awards in 2009. The new cabin contains 12 individual suites, designed to provide first class passengers with more privacy, greater comfort and increased storage. The first class suite includes an 80.5 inch fully flat bed, 23 inch personal TV/Video screen, a personal beverage department, in-seat massager, changing rooms and much more. The airline has long since conquered the title of having the best Business Class in the world. It is the most luxurious way to fly for business and pleasure. Discover a style and space like no other, in the World’s Best Business Class as voted by Skytrax 2009 and its 16 million users. To make the flight as comfortable as possible for corporate customers during their business trips, Etihad offers them the opportunity to sit back and relax in luxurious seats with 49-inch seat pitch and generous recline aboard the Etihad Pearl Business Class. The seats alone cater to all the comfort and needs of the average business traveler, providing them with privacy and space to go about their business as they please, along with seats that stretch out into 6ft 1” inch full flatbeds, with an adjustable headrest, footrest and lumbar support. In addition to the served meals – Etihad Diamond First Class and Pearl Business Class both offer a *Dine as you like, when you like! * option. Passengers can choose from an extensive á la carte range from the Anytime Kitchen menu available especially during those tiring long-haul trips with world class food and beverage managers in charge of preparing the food. For the passengers traveling Diamond First and Pearl Business classes with Etihad Airways, the airline also has Premium lounges at airports, opening three hours prior to departure, giving passengers an ideal opportunity to relax at the Six Senses Spa but also offering five-star dining and a range of entertainment options. Etihad Airways premium lounge services are not only available at their home base Abu Dhabi but also at Frankfurt and the new Heathrow Terminal 4 in London. Etihad has also extended its lounge services for their Premium passengers with the introduction of specially trained nannies, who have professional training in childcare and first aid to take care of the little ones while the parents enjoy the luxury of the Etihad Premium Lounge. Etihad’s guests traveling in first or business class are also able to enjoy Etihad’s complimentary limousine service – Etihad Chauffer – which is available not only throughout the UAE, but also in US, Canada, UK and many other destinations around the globe. The Residence, which is certified by the European Aviation Safety Agency (EASA) for single or double occupancy, offers levels of luxury and total privacy normally found only on private jets. Each Etihad Airways A380 will offer a boutique version of The Residence with different color palettes, table marquetry and custom carpets. Guests in The Residence will have the services of a personal Butler throughout their flight. Guests in The Residence will also have a dedicated VIP Travel Concierge team who will ensure every detail of their travel experience, including ground transport, cuisine, and amenities, are tailored to their requirements. Etihad Airways has redefine First Class and set a remarkable new industry standard with the launch of the First Apartment on the A380. Each First Apartment, which has a 64 inch high sliding door, includes a reclining armchair and a full-length ottoman, both upholstered by Poltrona Frau. The ottoman transforms into a separate 80 inch long fully flatbed. The First Apartment, which also includes unique features such as a chilled mini-bar, a personal vanity unit and a swiveling TV monitor for viewing from either the seat or the bed, has a 74 per cent larger footprint than the airline’s current award-winning First Class Suites. A fully equipped shower room is available on the A380 for exclusive use by First Class guests. Configured 1-2-1 in a forward and aft ‘dovetail’, the Business Studios all have aisle access and the seat converts into a fully flat bed of up to 80.5 inches long. With its privacy, ample storage and surface space, the Business Studio has been designed with the diverse needs of the premium business or leisure traveller firmly in mind. Redefine air travel luxury with Etihad Airways new Diamond First Class individual suites that give higher levels of comfort and more personal space than ever before. · Dine as you like, when you like. Choose from an extensive á la carte range or our ‘Anytime Kitchen’ menu. · Sit back and relax in your spacious first class seat – which, at the touch of a button, transforms into a 6ft 8” flatbed. · Our first class flatbed seats are upholstered with leather by world-renowned manufacturer Poltrona Frau, suppliers of Ferrari’s interiors. · Sink into a beautifully appointed bed with everything you need for a good night’s sleep. Drift into a comfortable sleep with pure, 600 thread Egyptian cotton sheets, cosy blankets and full-sized pillows. · Stay entertained on your first class flight with over 600 hours of on -demand entertainment, including the latest movies, TV shows, music and interactive games. · You decide how you spend your journey. And when and how we serve you. From limousines, to lounges, to onboard – experience comfort, luxury and an intimate atmosphere in Diamond First Class Suite. Etihad Airways Pearl Business Class, is the most extravagant way to fly for business and pleasure. Discover a style and space like no other, in the World’s Best Business Class as voted by Skytrax and its 16 million users. · Dine as you like, when you like. Choose from an extensive á la carte range or our Anytime Kitchen menu. · From limousines, to lounges, to onboard - experience comfort, luxury and an intimate atmosphere when you fly Pearl Business Class. · Enjoy the dedicated attention of your own Food & Beverage Manager recruited from the finest restaurants. · Sit back and relax in our luxurious business class seats with 49-inch seat pitch and generous recline. · Stay entertained on your flight with over 600 hours of on -demand entertainment - your ticket to the latest movies, TV shows, music and interactive games when you travel in our Pearl Business Class. Warm hospitality, individual attention and award-winning cuisine - discover why the best things in life don’t always come at a huge price. · Sit back and relax in your wide cradle seat, easily one of the best economy class seats in the airline industry. · Dining in Coral Economy Class is an experience to savour. Choose from as many as three main course options, one of which is always inspired by your destination. Indulge in our fine selection of complimentary drinks, hand-picked from around the world. · Stay entertained with over 600 hours of on-demand entertainment, including the latest movies, TV shows, music and interactive games, when you travel in our Coral Economy Class. · Your economy class seat lets you recharge your laptop or iPod or connect your personal devices to E-BOX, our entertainment system. · Our economy class mood lighting system creates the perfect cabin ambience for the various stages of your flight and according to the time of the day, providing a calming effect. · Children on Etihad flights find it easy to keep busy and entertained, be it with our range of entertainment options for kids or the special ‘family packs’. • Best Business Class Airline - Irish Travel Trade Awards 2010. • Best Airline to the Middle East and Africa - Irish Travel Trade Awards 2010. • Best Airline to Asia Pacific - Irish Travel Trade Awards 2010. • Best Long-Haul Airline - Business Travel Awards 2010. • World’s Leading Airline - World Travel Awards (WTA) 2009. • World’s Leading First Class - World Travel Awards (WTA) 2009. • Marketing strategy of the year - Middle East Business Achievement Awards 2009. • Best Business class - Business Traveller Middle East awards 2009. • Best Cabin staff - Business Traveller Middle East awards 2009. • "Middle East Deal of the Year" award - The Airfinance Journal awards 2009. • Best Business Class Airline award - World Travel Awards Middle East 2009. • Leading First Class - World Travel Awards Middle East 2009. • Leading Airline Lounge - World Travel Awards Middle East 2009. • Leading Airline Website - World Travel Awards Middle East 2009. • Leading International Marketing Campaign - World Travel Awards Middle East 2009. • Best Website - Freddies awards 2009. • Best Award Redemption - Freddies awards 2009. • Best Member Communication - Freddies awards 2009. • Best Bonus Promotion - Freddies awards 2009. • Best business class catering - Skytrax awards 2009. • Best business class - Skytrax awards 2009. • Top Worldwide Airline (Silver), 2009 Wanderlust Travel Awards, London, UK. • Best Business Class Airline (Second year in a row), Irish Travel Trade News awards, Dublin. • Best Airline to the Middle East / Africa , Irish Travel Trade News awards, Dublin. • "Airline of the year" Arabian Business Achievement Awards. • “Best business class service" Business Traveler USA. Destinations: Etihad flies to 108 destinations across the world giving Etihad passengers access to more than 96 cities globally on a single ticket and single booking. Family Guests enrolled in a Family Membership continue to receive 100% of the Etihad Guest Tier Miles they earn and carry on receiving all their personal tier benefits - so they'll also be eligible for promotion to Etihad Guest Silver and Etihad Guest Gold, and all the benefits of membership of these exclusive premium tiers. What's New? Online booking. Save 7% and get 2,500 miles when you book online at the Etihad Website. What to Expect: Friendly staff, reliable service and luxury amenities. 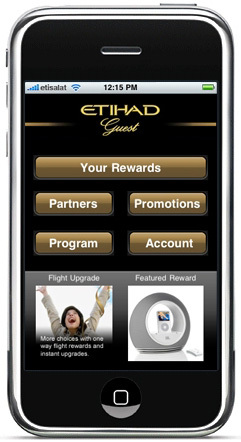 Etihad Airways is proud to announce the launch of a new Apple iPhone application for our members. It is the first application of its kind to offer real-time miles redemption for its users. The application is available free to download and use from the Apple iPhone store. This will provide you with an innovative and user-friendly tool designed to assist and manage your accounts and stay informed about the latest promotions. • Read general programme information. 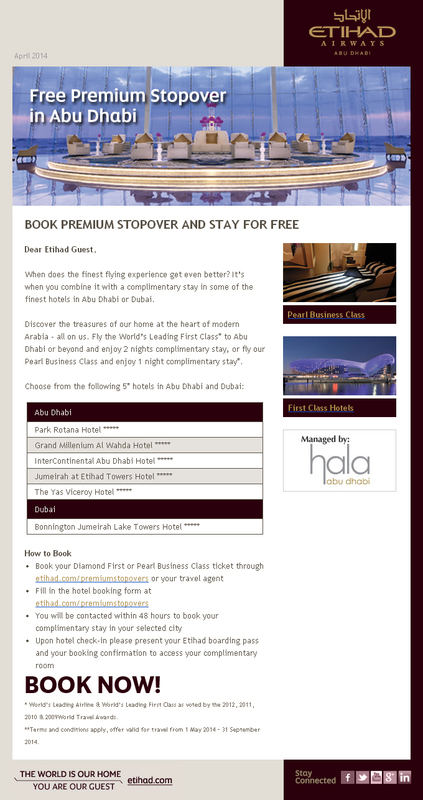 Download your free Etihad Guest iPhone application now! On DhakaSnob.com, we send your comments directly to the business owners. This way, owners know the comments are authentic and can address concerns on a personal level. Commenting also helps us to determine which businesses get approved for a listing on our site. When you want a discreet way to express yourself while creating real change and results in our local businesses, you can rely on DhakaSnob.com.